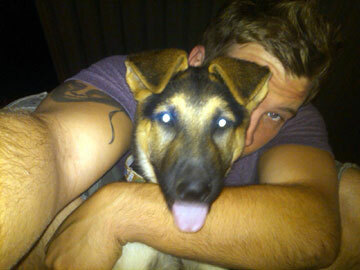 Hi, Here is a pic of my 11 wk old GSD "Vinnie" and my son. Vinnie is a wonderful little guy, playful, attentive, eager to please and sensitive. He loves everyone in the family, including all the children. My 6 yr old Granddaughter Kendall leash trained him. He still doesn't care for the frisbee, but I'm working on it lol. He's the best! Hello Debbie, what a great GSD story. And thank you so much for sharing your great story about your wonderful German Shepherd puppy Vinnie. It's always nice to hear about all our baby German Shepherds out there. And what a wonderful picture - I love it!